“The appeals court in Sale has accepted the bail demand of three of these six activists, after it was rejected last Thursday by the military court,” Mohammed Sebbar said. The military tribunal in Rabat accused the six of “treason and intelligence with the enemy”, but none of them have yet been tried. This entry was posted in Human Rights, Political issues on May 20, 2010 by appleton. 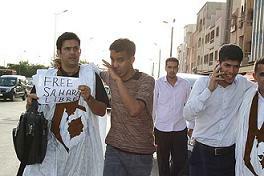 After Forty-one days the six Sahrawi prisoners of conscience in Sale, Morocco ended their hunger strike. We want to announce to the public that we have decided to suspend our open hunger strike on the evening of Tuesday, April 27th, 2010, after we have received pledges from the Moroccan authorities following many dialogues and meetings during the last two weeks of the strike regarding our case. This entry was posted in Human Rights, Political issues on May 2, 2010 by appleton. Sharan Burrow, ACTU President, has written on behalf of the ACTU to His Excellency Mr Ban Ki-Moon, UN Secretary-General, voicing concerns that the latest report on Western Sahara S/ 2010/175 has failed to deliver on two crucial points: the referendum, and the implementation of mechanisms to monitor human rights in occupied Western Sahara and in the refugee camps in south west Algeria. This entry was posted in Human Rights, Phosphate importation, Political issues on May 2, 2010 by appleton.